Every June you have a chance to visit historic Galena in the Northern Black Hills. A chance to explore the historic gold and silver mining camp. Walk the old rail bed and get a feel for what it must have been like during it’s hey day. The 2014 walk is scheduled for Saturday June 14th from 9am to 2pm. The historic walk can be 1 to 5 miles. Plus they will have food and music at the old school house.. This is a great opportunity for all the history buffs and people who like exploring the Black Hills. They post historic photos along the trail and locals are on hand to answer questions and explain some of the area’s history. You can visit the Vinegar Hill Cemetery and see the remains of the old Methodist church steeple. 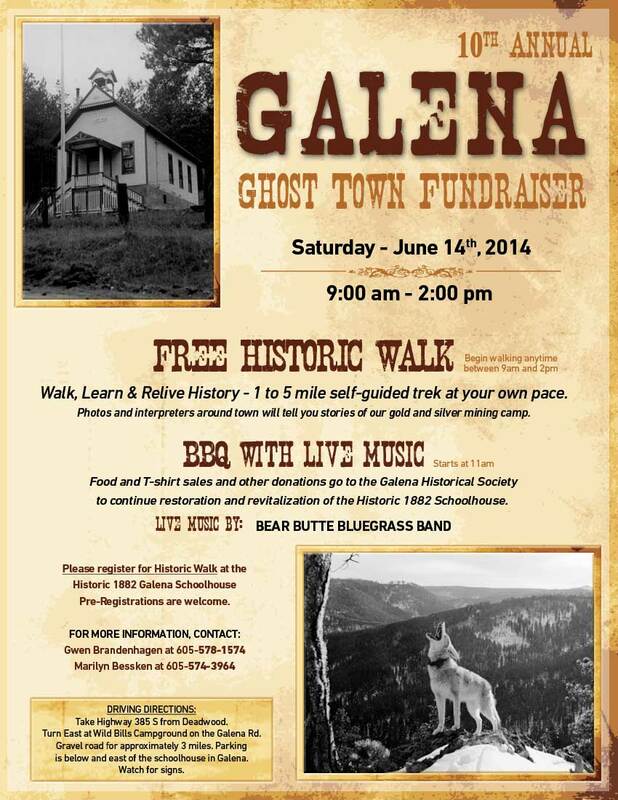 For complete information be sure to visit the 1882 Galena School House website or read the flyer. Galena is located south of Deadwood. Turn off highway 385 at Wild Bill’s Campground on to Galena Road. Follow the gravel road to Galena (about 3 miles) and there you will find people directing parking. Head to the old school house to register and get a map. Once you complete the tour and haven’t had enough historic cemeteries yet, Deadwood has a couple worth visiting. Mount Moriah is the resting place of some of Deadwood’s most famous former residents like Wild Bill and Calamity Jane – plus a short hike above the cemetery will take you to the graves of Seth and Martha Bullock. Saint Ambrose is lesser know but equally interesting cemetery just across the gulch.